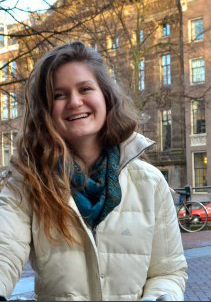 Since arriving in Amsterdam in January, Bryn Clark, A14, has experienced a lot of “I can’t believe I’m really here” moments: biking along the canal at twilight, the city skyline swathed in warm, twinkling lights; pausing to breathe in the centuries of history around her; and sitting in a class at the University of Amsterdam with Dutch, American, and other students who inspire her to speak up and share ideas. “The most rewarding part of one of my classes, Experiencing Differences, is learning about how marginalized groups in society experience differences and how people cope in a specific setting. The foundation of the class is group discussion and the dialogue and ideas that each student brings to the table are incredible. “I’ve been really lucky to experience that similar classroom setting at Tufts; that’s definitely helped me propel into deeper academic conversation. It’s been wonderful to talk to the Dutch people I’ve met so far about what they think about other people’s perspectives on the Netherlands or on America, and to think critically about the society I’m from. I’m really looking forward to having more of those discussions with Dutch friends that I make, and also to live here to the point where I’m no longer a visitor but a true part of Amsterdam.